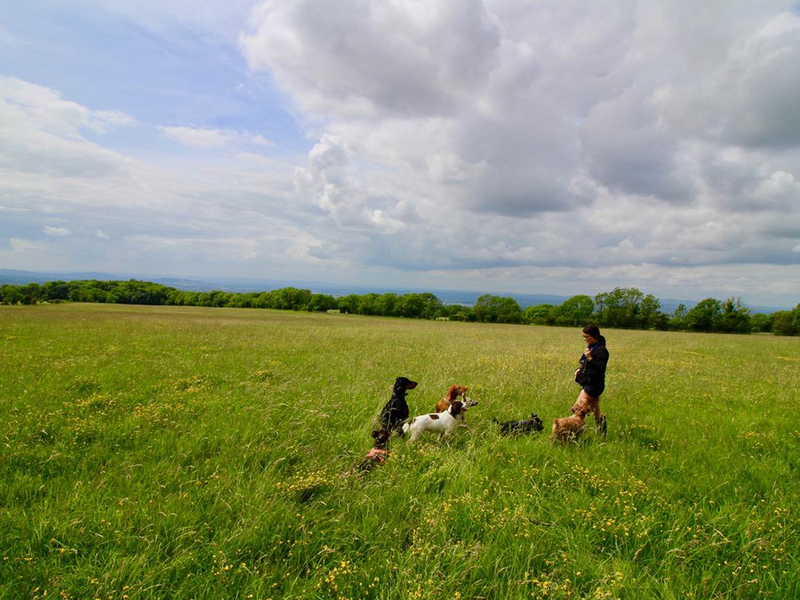 A BEAUTIFUL COUNTRYSIDE DOG DAY CARE EXPERIENCE SERVING CHELTENHAM AND SURROUNDING AREAS. WITH INDOOR AND OUTDOOR FACILITIES FOR ALL YEAR ROUND DAY CARE. WE EVEN COLLECT AND DROP HOME FREE OF CHARGE! We believe in quality of care for all dogs, part of this is creating an environment that they can thrive in. Our dog day care centre is just that! Located on the Cotswold Hills, a few miles walk from the popular dog walking spot of Cleeve Hill. 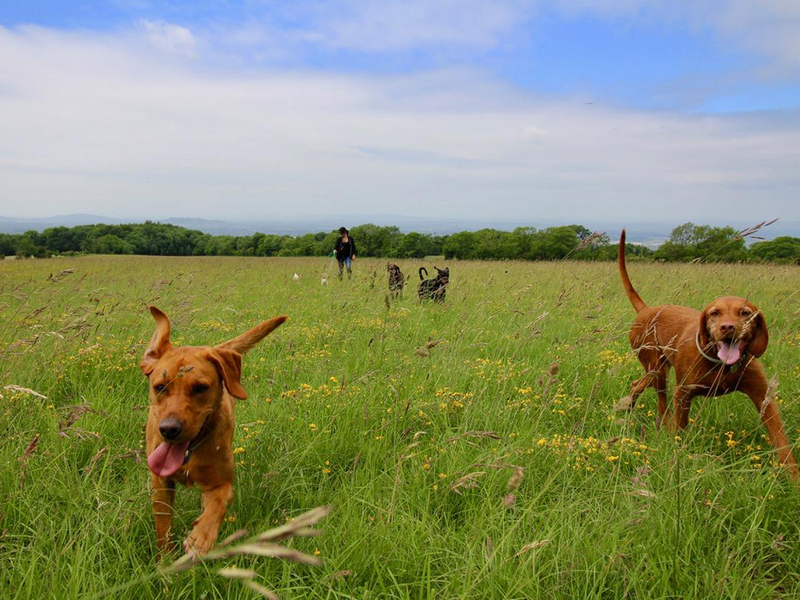 We are set in 60 acres of secure, private land to exercise our dog day care guests and an indoor play barn for activities, snoozing and grooming before home time. 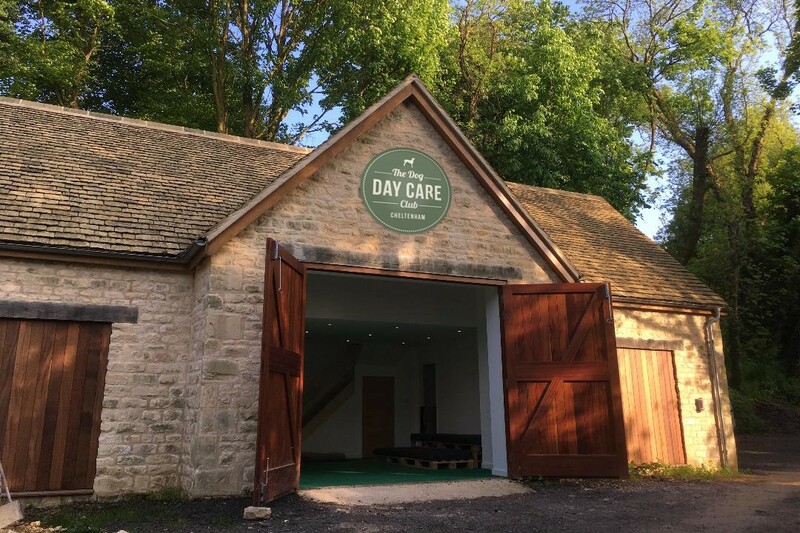 We are very proud of the site we have here at The Dog Day Care Club, we feel it offers everything a dog could need for a happy, safe and stimulating day. Your dog will be treated as one of the family from the minute we collect them from your home. They will walk, play and socialise all day long, have dedicated training and snooze times throughout the day, before finally being cleaned up and returned home very happy and tired once you’re back from work or at the time arranged. You can have complete peace of mind that your dog has the love and attention they deserve whilst you’re out. Experienced team of dog handlers – everyone in our team has owned and worked with dogs most of their lives! Strict member criteria – we only accept social, friendly dogs that have passed a successful trial period. Market leading indoor and outdoor exercise facilities – we have a 1500 square foot indoor play barn, set in 60 acres of land with access to directly to the countryside for walks out! Dogs are supervised by their dedicated carers at ALL times. A. Yes. The Dog Daycare Club is insured with specialist animal trade insurers. This insurance covers public liability, day care, custody, control and transportation of your dog. A. Yes. 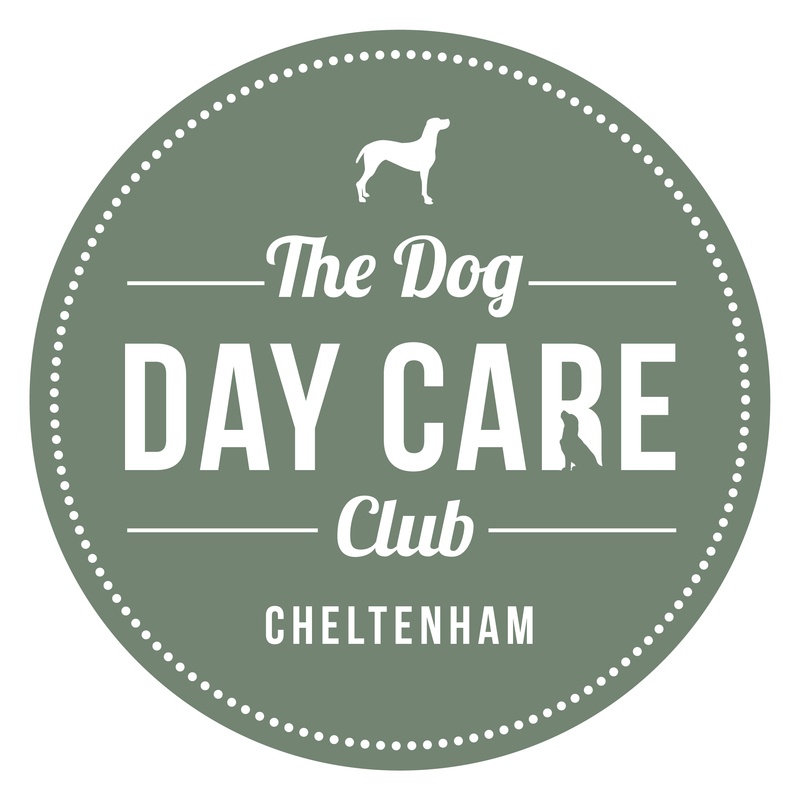 The Dog Daycare Club is licensed by Cheltenham Borough Council. License 18/01048/ABE. Q. Can I meet with the team and see the facilities before sending my dog? A. Yes. We would absolutely recommend that you do this. Come and see the wonderful facilities that we have to offer your dog and get a better understanding of what they will do with us. Q. What happens if my dog doesn’t get along with another dog? A. The Dog Daycare club has strict policies on only accepting social dogs, ensuring that all dogs will be happy in each others company. Q. Do you accept entire males? A. Puppies up until they are 1 year old. After this point we are unable to take them. Q. Do I need to be home when you collect/ drop off my dog? Q. Will my dog be supervised at all times? A. Yes. Your dog will be under constant supervision by their dedicated handler. Q. Do I need to book regular days? A. Yes. You will need to commit to regular days as spaces are limited. Minimum of 1 day per week. This also gives your dog the best opportunity to settle in and make the very most of his/her time with us. Q. Can my dog stay at the club overnight? A. No. Dogs cannot stay overnight at the club. We do offer home from home boarding so if you would like more information on this please ask. Q. 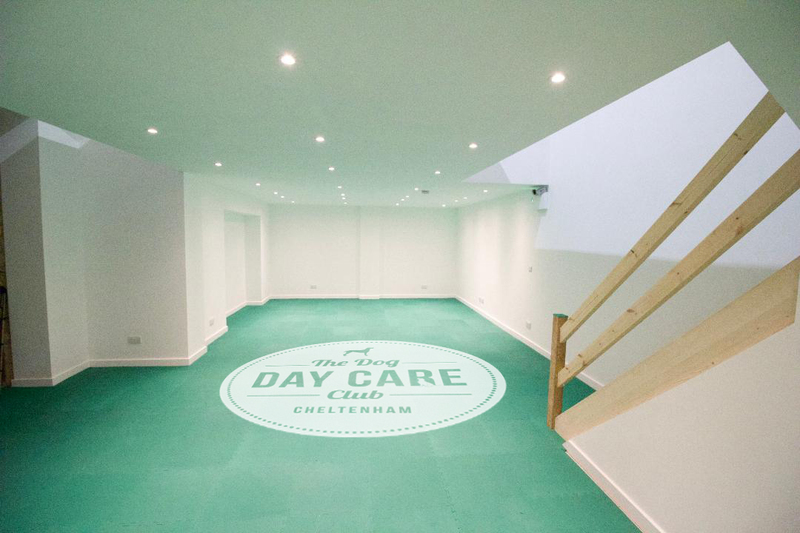 Do you offer daycare on the weekends and bank holidays? A. The Club will be closed over the weekend and bank holidays, however we are able to offer group walks across these periods with The Dog Walker, again please ask for more details.